Last October, Cañada students put their talent to the test and created films during Campus Movie Fest, the world’s largest student film festival for the next generation of filmmakers. The Cañada Campus Movie Fest, hosted by Cañada College Student Senate, was a weeklong film competition where more than 200 students created and shared their stories. At the red carpet finale, the College selected the films “Heroism” and “PhotoCorpse” as the winners. “Heroism,” created by Ivy Woolridge and Elizabeth Birdwell, is an inspiring film about love, hope, community and supporting others. 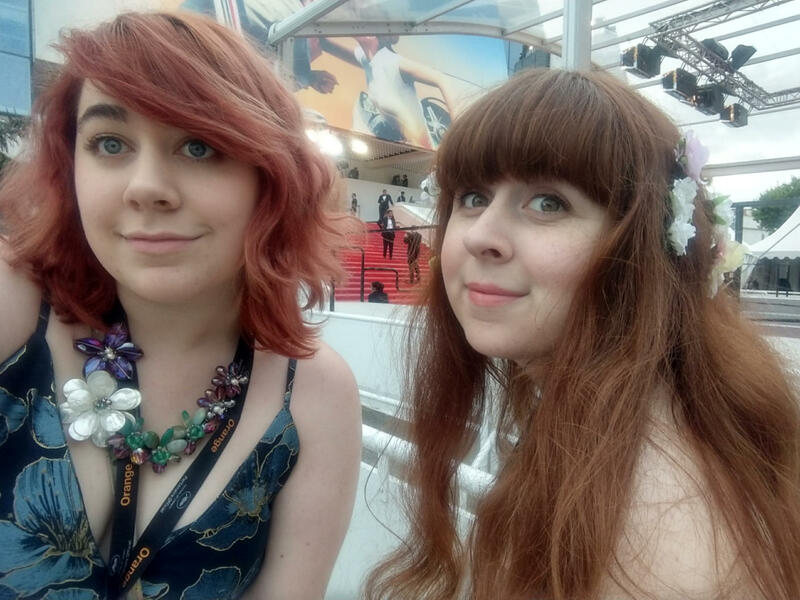 Ivy and Elizabeth have traveled the world with their film, including a stop at the Cannes Film Festival in France. The College checked in with them to hear about their success following their win at the Campus Movie Fest. You entered your film “Heroism” in the Campus Movie Fest on campus, which eventually got you into the Short Film Corner at Cannes Film Festival. Congratulations on your success! What was the most challenging part of making your film in such a short amount of time? IW: One of the greatest challenges was just being unfamiliar with video equipment and some of the editing software. The type of movie we did - animation over live action - was pretty unusual and ambitious for a student film in this festival. What helped us the most was the background in animation we had from our classes at Cañada College. EB: I’d say the most challenging aspect was just the worry of not having time to finish the film, or that something could go wrong, etc. It was the first time I’d entered something like this, so there was a large element of unknown that came with it. Do you two always collaborate on projects? IW: Not always, we do each have a few pet projects of our own, but we love working together and we get along really well. Sometimes we’re even mistaken for sisters! EB: Not always, but we have a lot! We’ve been close friends from a young age, so we work together pretty well and enjoy collaborating on stuff. Are you planning on entering the Campus Movie Fest again? IW: Absolutely! We’re going to rock the Festival this year. We have the beginnings of an idea we love and we did some research that led us to an amazing resource we can use in this year’s film. No spoilers! EB: Yes! We have an idea for our next film that we’re super excited about! What was your favorite part about going to the Cannes Film Festival in France? IW: It was hugely educational. We couldn’t have done it without the support of a lot of people at Cañada College- the Digital Art and Animation Department especially, as well as the Student Government and even the Fashion Department. We learned so much in a short time about so many aspects of filmmaking and the marketplace. It was an invaluable and life-changing experience. Walking the red carpet and seeing film premiers was amazing, too! EB: The friends and connections I made, from both Campus Movie Fest and the Cannes Film Festival. I got to meet some different student filmmakers/animators from around the world, which is just really cool! Other than that, my #1 favorite moment was probably when I got to watch the cast of “Solo: A Star Wars Story” walk up the red carpet for the movie premiere. The entire festival was amazing and I can’t thank everyone enough who’s supported us on our journey. Have you gone to any other film events? IW & EB: Yes, we attended Terminus Film Festival in Atlanta, which is a big film and video game conference. We were nominated for a Golden Tripod for our editing as well as for Best Picture! We didn’t know we’d been nominated until the night of the awards ceremony. We didn’t win, but being nominated means that we were one of the top 5 student films in the entire nation. It was actually an honor just to be nominated! What do you enjoy most about the Digital Art and Animation Program at Cañada College? IW: What’s not to love? We have the best teachers, amazing classes, and a supportive environment to work and learn. The instructors really take a personal interest in our education and success. We really think the Animation Associate Degree here should be turned into a 4-year-degree, the program is just that good! EB: The program has benefited me in multiple ways, in fact I didn’t even realize that animation is what I wanted to pursue until I decided to try out one of the classes. I’ve learned so much material that’s helped me improve my work through the program, the instructors are all super fun and awesome people, and I just love the overall atmosphere and being surrounded by other people who love the same stuff I do! IW: I’ve found inspiration in many different areas throughout my life. My experiences and the people I’ve come to know have played hugely in what gives me the inspiration and drive to create. Other sources of inspiration can come from places like music, movies, and just being out in the world! There’s so much beauty in the world all around us. EB: Animation (obviously) music, artists, movies, places, almost anything sci-fi, people I know, people I don’t know, etc…too many things to count.